I really miss my grandmother ... my Grammy, my mom's mom. I'm not sure why but lately, she's been on my mind an awful lot. It might be the new Decemberists album, which has a decidedly folksy tone to it, and that floods my mind with memories of her and her old house. My Grammy was a farm girl, and my mom and her siblings were raised on a big farm in Connecticut. They had the usual livestock, and when her nest emptied and her helpers moved away, the farm dwindled. As a kid, I loved going to visit Grammy's - especially playing hide and seek in the barn or late-night games of flashlight tag around the horse pen. The barn had a very specific, earthy smell to it, and I can still remember the feeling of the dirt in there. It's one of those odd comforts that completely captivates you any time you feel or smell anything like it. 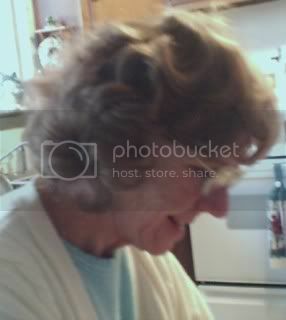 My Grammy was the thinnest woman I'd ever met, which was completely incomprehensible because I don't remember ever seeing her eat anything besides grilled cheese sandwiches or homemade chocolate chip cookies (or Hershey Nuggets with almonds, which she always had a bowl of on her coffee table). 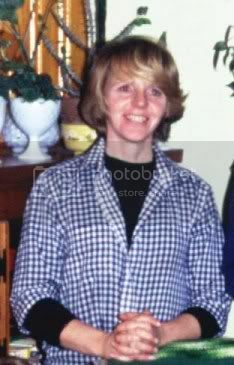 She had always been thin - my mom said it was a combination of always working on the farm and never being in a financial position to overeat - and she always talked about needing to lose weight. Even as a little kid, it made me self-conscious. If *she* is disgusting, what am I? I disagreed with the lifestyle my mother adapted when my parents divorced, and my relationship with my grandmother was never the same after that, even after my mother and I reconciled. She retired, sold her farm, and moved down South shortly thereafter, and even though we exchanged occasional e-mails, it was mostly factual life updates from my side and thinly-veiled criticisms from her, so they were few and far between. After my Grammy moved to Florida, I never saw her or physically spoke to her again - not a deliberate choice, but more a result of my going off to college and her keeping busy with her part-time job at a hospital taking pictures of newborns. Her death in 2006 at age 63 was completely unexpected, and it really crushed me. We hadn't spoken in such a long time, and it was my first serious loss of a loved one. With that came the realization of just how permanent death is. I never got to know her or to really speak with her like an adult, and that's a chance that I will never get. After her passing, I learned all sorts of things about my Grammy, things I never knew we had in common. She too preferred pearls over diamonds and loved "The Golden Girls" ... and she had also had a relationship with a man she later found out was married. This last fact was the one that broke my heart, to be honest. My Grammy was a very proper lady who never talked about anything "inappropriate," but I'd like to think that I could have opened up to her and asked for her advice on how to deal with that very particular kind of broken heart. I loved my Grammy very much, and I know she loved me, even if she wasn't great at expressing it - I know she meant well, even when she would talk about my weight as if I weren't in the room. I just wish I had kept in better contact with her, and that we could have been closer when she was alive. And I wish she was here now so I could show her all the progress I've been making ... and so I could cook her something besides a cheese sandwich. Grief is such a funny thing... it can disappear for so long and then suddenly hit you like a Mack truck and throw you for a loop. The only person I've lost that I've been close to was my brother, so I really don't know what it's like to lose a grandparent, but I know what it's like to lose someone suddenly and unexpectedly. We can certainly drive ourselves crazy hoping and wishing that we could have spent more time together, more time talking. I honestly believe the fact that you're thinking of your Grammy is because she's around you... and trying to send a message to you that she is so proud of you. Often times I risk sounding crazy... but I have seen a very talented psychic/medium before and made contact with my brother. I am 100% certain it was legit, because the man knew things that only me and my brother knew. He blew me away several times. He said that often if you start thinking about a passed loved one suddenly, it's because they are there with you. She probably knows you've nearly (or have) hit your 100 pound loss and is trying to tell you that she's incredibly proud of how far you've come! Whenever I'm missing my brother, I always write on his Facebook wall... and I find it very comforting. I suggest since you can't do that, perhaps you write a letter to your Grammy telling her how you feel and how you miss her. It'll probably make you feel better (if writing this post didn't help). What a beautiful tribute to your grandmother, Mary. I was always told that we never truly grow up until we experience our first loss of a close loved one. That was certainly true for me when I lost my dad. I'm sure she would have loved reading this post and I know she'd be terribly proud of you right now. My grandmother and I had a totally different relationship than you describe here, but I share a lot of your feelings now that she's passed. (She died unexpectedly when I was in high school.) I guess that means there are always regrets and wishes when somebody leaves your life, for any reason. Like Amy, when I am missing my Dad I write to him. Sometimes I keep the letters and sometimes I take them to the cemetery and let the wind blow them away. I can't imagine losing my grandmother. Its great that you are able to look back and remember all the things about her that you loved. Just because she isn't here to celebrate your successes doesn't mean that she wouldn't be proud of you. Just remember that you keep her alive in your memory! This is one of the hardest things in the world. Know in your heart that it's all good! Take comfort in that, at least!